(CNN) -- If you want to stare deep into the crater of the world economy, look at the largest public company listings over the past year. 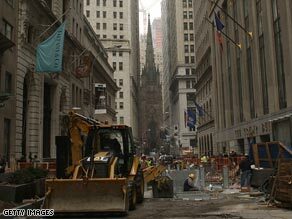 Wall Street under repair is emblematic of the IPO market collapse on its trading floors. By May 2008, a U.S. credit card giant and a Chinese national railroad company raised a combined $25.4 billion in their initial public offerings. The two largest IPOs so far this year? A U.S. baby formula maker and a Chinese aluminum manufacturer, together raising about $2 billion. Gone are the days of high-tech or high-finance companies going public. "You can't get any more basic than baby food or aluminum manufacturing," says Lawrence Chia, a managing director of Deloitte and Touche in Beijing. China Zhongwang became the largest global IPO so far this year when it raised $1.2 billion before its listing on the Hong Kong Stock Exchange today. In February, Mead Johnson, maker of Enfamil baby food, raised $828 million on the New York Stock Exchange. Last year, IPOs for credit card processor Visa and China Railway Construction raised $19.7 billion and $5.7 billion, respectively. The global IPO market has become a ghost town. Just 17 months ago, nearly 600 IPOs raised a quarterly record of $102 billion, according to Ernst & Young. Compare that to the first quarter of this year -- 51 IPOs which raised $1.4 billion. Could Asia help global recession? "That's almost nothing," said Gil Forer, the London-based director of IPO consulting for Ernst & Young. "That's less than one a week ... they used to be happening on a daily basis." The global IPO market was cut more than half last year from its record-breaking pace in 2007, when nearly 2000 deals raised just under $300 billion. With the lowest market valuations since the 1980s and volatility making offerings difficult to price, companies have withdrawn or postponed IPOs in record numbers. "The capital markets around the world are dead right now, there's hardly any financing in the marketplace," Chia said. Some hope that the Zhongwang IPO could signal a return to growth in capital markets. The Shanghai stock exchange is up more than 40 percent this year; the S&P 500 has regained all its 2009 losses. Hong Kong newspaper The Standard reports that two other Chinese firms -- a buildings supply maker and a herbal shampoo company -- have plans for IPOs soon that are expected to raise a total of $1 billion. But industry watchers say the market is far from recovery. "We don't see the light at the end of the tunnel yet," said Forer of Ernst and Young. "First of all, the markets need stability -- one day it's up, and one day it's down," Forer said. "The markets need stability for at least two or three quarters." China Zhongwang's listing is riding favorable winds of the stock market rally and the Chinese government's $600 trillion stimulus package -- nearly a third earmarked for road and building projects that are sure to increase Zhongwang's bottom line. "We're in the eye of the hurricane right now," said Steve Mullinjer, managing partner for Heidrick & Struggles China. "What you're seeing is smaller IPO exits for companies who can't afford to wait for the capital needed to grow their business. "At least in China, you're probably two or three years away from seeing a return to the mega-deals," he said.